BECIL Data Entry Operator Recruitment 2018 is available now for the candidates who are interested to apply for this BECIL Jobs. The board of Broadcast Engineering Consultants India Limited (BECIL) unleashes the BECIL Notification and this application process was available from 29th August 2018 to 17th September 2018. In this BECIL DEO Recruitment issues the 50 Data Entry Operator Jobs. Candidates, who want to get the opportunity in this board, those ones check the eligibility details on BECIL Official Notification. 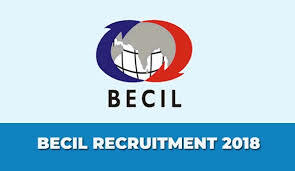 As per the registration purpose, the BECIL DEO Application Links are provided in this page. Check and use it. A hearty welcome to the job seekers in our web page. Aspirants, just give small break for your job searching process. Because the BECIL DEO Notification was waiting for the eligible ones. Once check the details in this page. The organization of Broadcast Engineering Consultants India Limited (BECIL) wants to recruit the willing candidates in their organization in the posts of Data Entry Operator. In this BECIL Data Entry Operator Recruitment purpose, the officials release the 50 posts. This is the best opportunity for the aspirants who are eagerly browsing for the latest state govt jobs. In this page, we can give all information about this notification, so follow up the web page of @ www.jobschat.in and get the worthy information. This BECIL DEO Jobs application process was running now and most of the candidates stated their application process. This application submission process was started on 29th August 2018 and aspirants have the chance to submit their registration forms in before the due date of 17th September 2018. After the last date, the officials can’t consider your application forms. This BECIL Recruitment is based on the state govt. The Uttar Pradesh state candidates feel happy about this notification. Because this @ becil.com BECIL DEO Recruitment gives the chance for graduated and non-graduated candidates. So all candidates seeing interest in these jobs. Applied candidates, finished their Graduation from a recognized University with English Typing speed of 35 wpm on computer. Non-graduate with English Typing Speed of 35 wpm on computer. But the pay scale and facilities are different from the graduate and non -graduate candidates. Aspirants, who wish to apply for this BECIL Data Entry Operator Recruitment, those ones should check the BECIL Official Notification for knowing the age limit details and age relaxation details. For BECIL Data Entry Operator Recruitment 2018 selection process details refer the BECIL Data Entry Operator Official Notification. Applicants, pay the Examination Fee through Debit Card, Credit Card, Net Banking or demand draft is drawn in favor of Broadcast Engineering Consultants India Limited payable at New Delhi. For this BECIL 50 DEO Jobs, the applicants must and should know about the English typing skills on the computer. Because their work was based on the typing. Maximum the officials conducts the typing test in the selection process. But we can’t sure which tests are conducted by the board of Broadcast Engineering Consultants India Limited (BECIL). However, the board pays the highest salary for the selected candidates. But they give variation between the graduation based jobs and non-graduation based jobs. You want clear information about these BECIL jobs, refer the BECIL Data Entry Operator Official Notification. Applicants, also download and prepare the Syllabus for the selection purpose. This BECIL Data Entry Operator Recruitment application process was based on the offline mode. You should download the application form in this page and submit it on the given postal address. The postal address was given in the above page. So in this posting time should check it and post the correct mentioned address. The duly filled in application form along with self-attested photocopies of educational/experience certificates, two passport size photograph, Aadhar Card, Pan Card. The @ becil.com BECIL DEO Application Forms are given in the below page. These application forms are given in the prescribed format. So you can easily catch on the provided links. You can also follow the Previous Papers in this page in addition to this BECIL Notification.